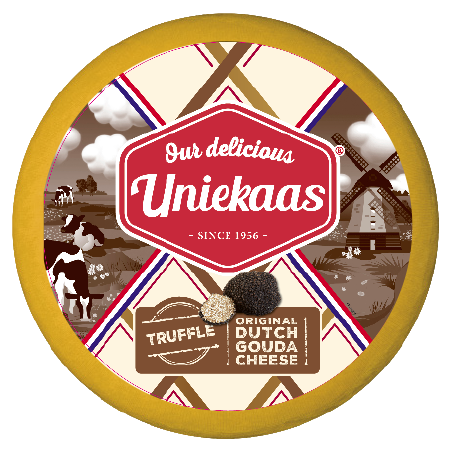 In the early 1950’s, the basis was laid down for genuine Dutch quality cheese, made by the use of traditional procedures and craftsmanship. 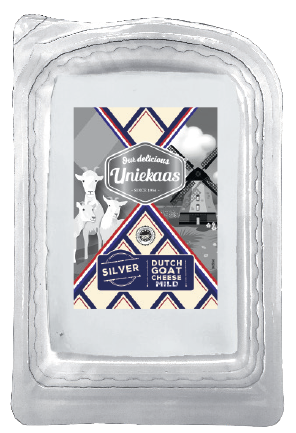 In 1965 this led to the brand Uniekaas, that today still has a robust position in Dutch supermarkets. From 1965, the organisation evolved from a group of associated cheese traders into a single efficient organisation in 1999. 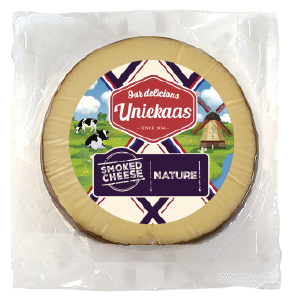 Since September 2009, Uniekaas has been working from their location in Kaatsheuvel. 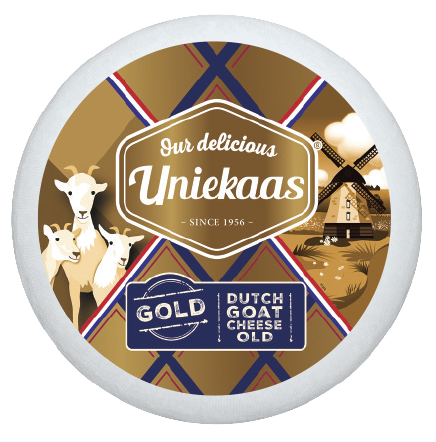 Uniekaas cheese is still made following traditional recipes, using only pure ingredients. Just like in the old days, but by using today’s methods of production. 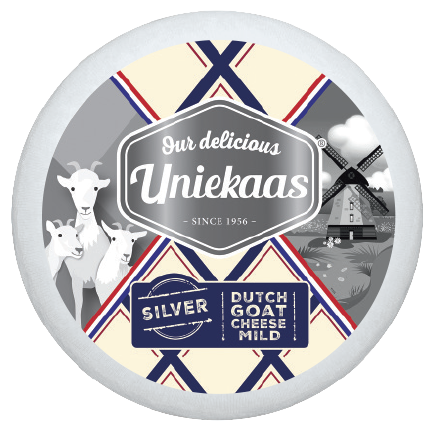 It’s hundreds of years of cheese making, plus the best recipes and the passion to innovate with technology, that allows Uniekaas to bring a range of authentic Dutch cheeses to your table. Enjoy! 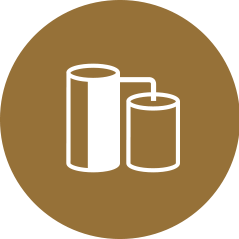 The milk produced by more than 800 active dairy farmers is processed to make internationally recognised quality products for retail, foodservice and converters. Our close cooperation with DOC Kaas, the second largest Dutch dairy cooperative, ensures us access to two operational production plants in Hoogeveen which currently produce over 100.000 tonnes of Dutch cheese yearly. A large variety of cheeses are naturally ripened under accurately conditioned and smartly automated conditions. Currently we have 1.5 million kg of cheese ripening in our facilities. Directly from the warehouse, all carefully ripened cheeses are efficiently cut and packed into 250 different products, via professional packaging lines. Our professionals in the field of marketing, sales and logistics can help you match your cheese range with the requirements and wishes of your customers. 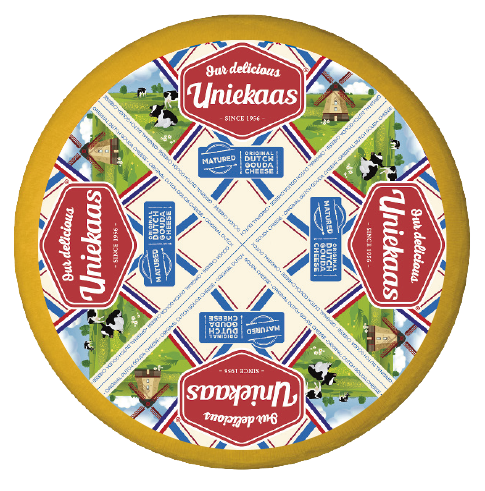 At Uniekaas, we take great care to control every process of the cheese production, starting with family owned farms and co-operative milk dairies. The green meadows however ensure the Uniekaas cows’ milk is so rich and creamy. 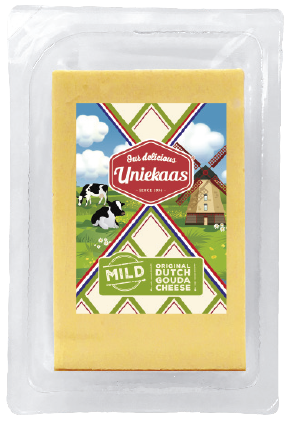 Producing this flavorsome milk, which once churned, gives Uniekaas cheese its delicious and unique taste is the devotion of the farmers we rely on. 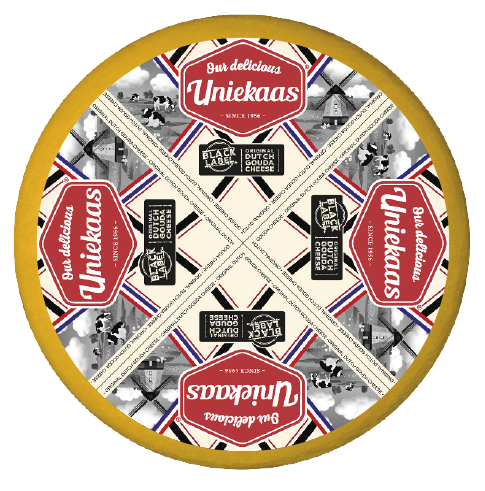 All Uniekaas cheeses are passionately created to have their own distinctive characteristics, which make them so special and stand out. 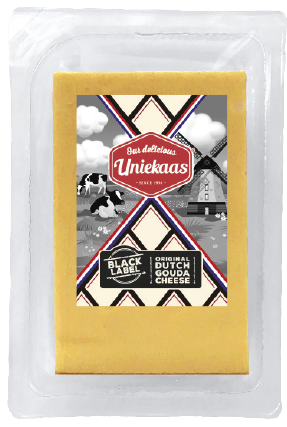 To accomplish the authentic Gouda ripening our Uniekaas cheese master controls all of the cheese batches. From stirring until the right temperatures are reached, to turning of the cheese wheels to insure that the coating process takes place. All this is necessary to achieve the highest quality possible. At the end of its aging process, the cheese master carefully drills into the heart of the cheese wheel and removes a piece to smell and check that the aroma is good and healthy. Only when he is convinced that it is at its best, then, but only then, it can be prepared for the next stage. 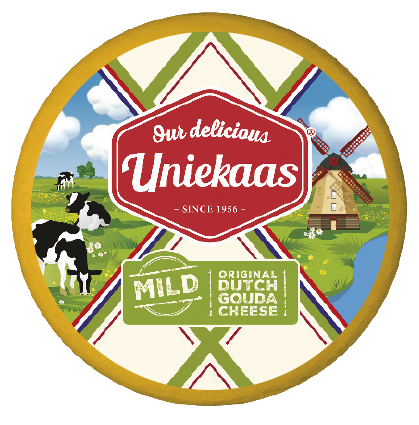 Uniekaas Gouda Cheese is PGI-approved (Protected Geographical Indication), which means that the Gouda cheese produced at Uniekaas is made with 100% pure Dutch milk, 100% Dutch ripening methods according to 100% Dutch recipes. Of course all of these aspects are strictly monitored by the European Union as well as the Dutch authorities. 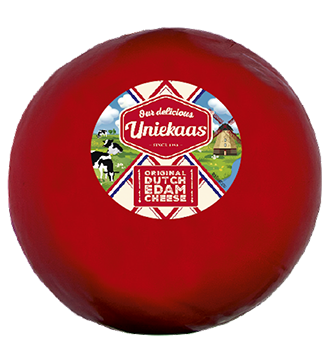 By the way, every cheese offered under the Uniekaas brand is naturally ripened Dutch cheese. 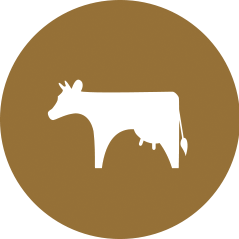 Together with DOC Dairy Partners, Uniekaas covers the complete supply chain from milk production to cheese branding and distribution. This means we have full control of every step of the process from farmer to consumers. It assures our products are as pure, tasty and natural as cheese should be. Our production location in Kaatsheuvel contains all the facilities for ripening, cutting, packaging and distributing cheese, thus meeting the highest standards of both retailers and consumers. 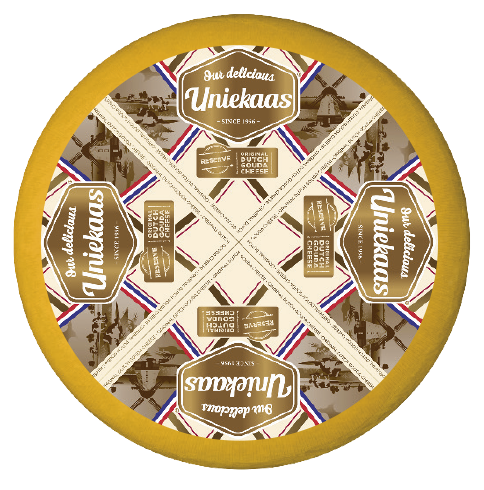 On 21st March 1956 a small cooperative of local Dutch cheese craftsman founded their own Dutch Cheese Union. 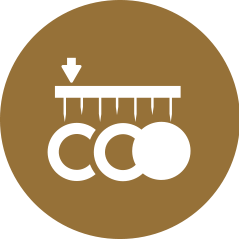 Their ambition was to establish a collective purchasing structure, while guaranteeing and achieving a high standard of quality control. 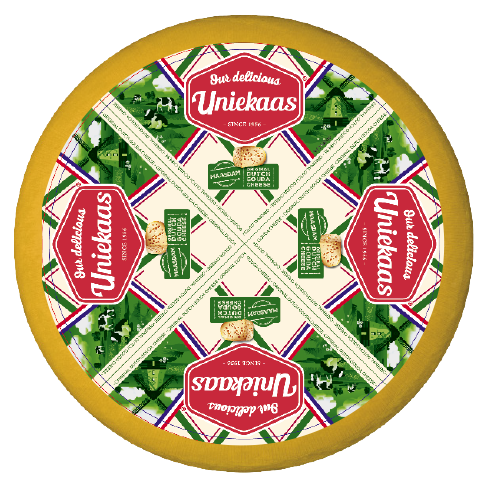 In 1965 that became Uniekaas, a brand that has since established a robust position in Dutch supermarkets. From 1965, the organization evolved from a group of associated cheese traders into a single efficient organization in 1999. 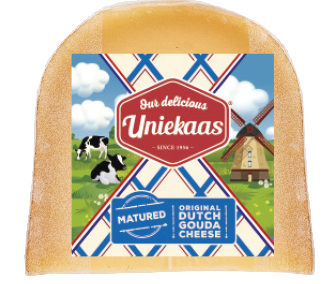 Since September 2009, Uniekaas has been working out of their single location in Kaatsheuvel. 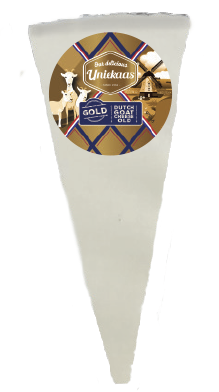 Gouda is an iconic Dutch cheese named after the city of Gouda in the Netherlands. 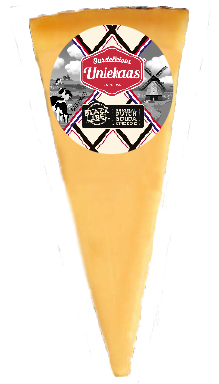 It is a semi-hard cheese, highly appreciated for its rich, unique flavor and smooth creamy texture. The Goudse Waag in Gouda is a historic building (1668) that was built by the famous architect Pieter Post. It’s the centerpiece of Holland’s only authorized cheese market during the Middle Ages. Here the commodities for sale were weighed and taxed. Since 2008 the cultural heritage site “De Goudse Waag” (The Weigh House) in Gouda is owned by and lovingly cared for by Uniekaas. Protecting the Dutch cheese heritage means protecting nature, cattle and each other. It all starts with the lush green meadow grass and the well-being and health of the cattle who graze on them. 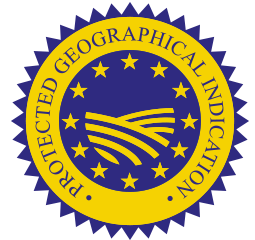 All these aspects are of course controlled, validated and certified by the Dutch and European authorities. 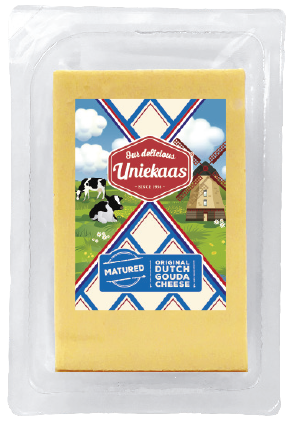 Managing raw materials and energy use, consciously and innovatively, from production to consumption, is what Uniekaas is all about. 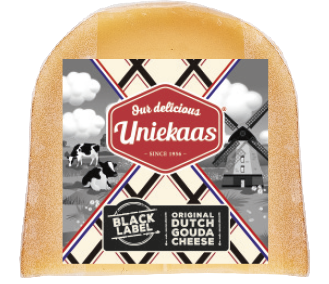 Experts at Uniekaas are continuously exploring ways in which cheese can be better packaged, improving preservation and keeping the taste fresh and full of its original flavor. 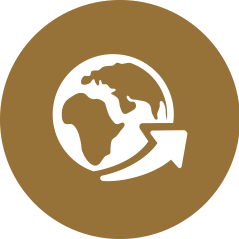 Our efforts are also to monitor and minimalize the environmental consequences that production and recycling has. By carefully planning transport, storage and refrigeration we save energy and minimalize our impact on our surrounding and the environment. A strong brand is built upon sustainable relationships. 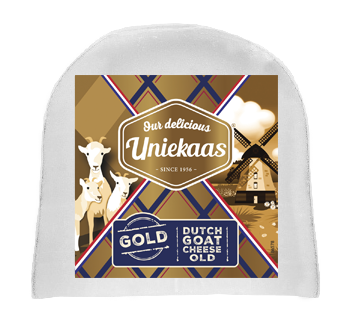 Uniekaas appreciates and supports its long-term collaborative working ties with retailers, some of them go back as far as the very beginning. 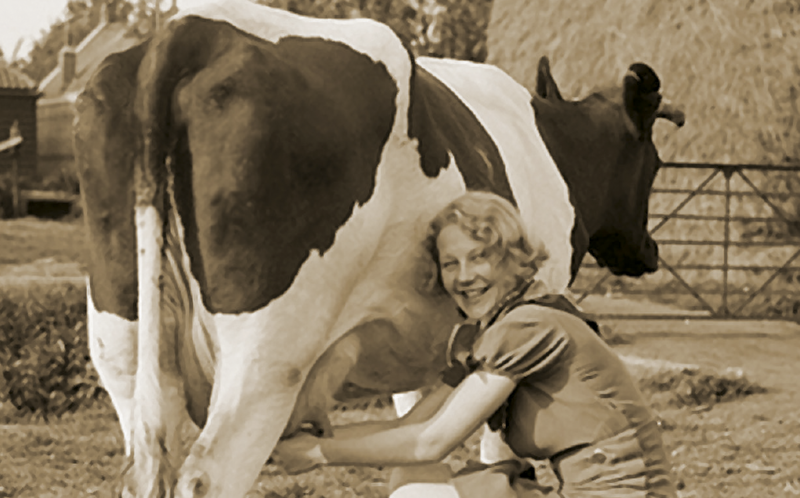 Dairy is often a family business. Generations pass on their craft. 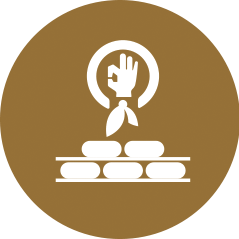 Uniekaas promotes the protection, development and transfers of these skills and values. It is crucial to our products that you so enjoy! The information in this brochure is based upon our standard product range. 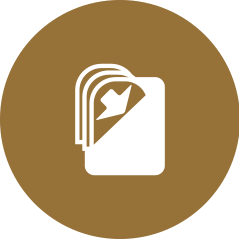 More product and packaging forms are possible.